I miss 'True Blood' and it's star Anna Paquin is rarely seen on & off the red carpet. However the actress was on hand for the premiere of 'Flack' at the Ham Yard Hotel yesterday(November 13th) in London. 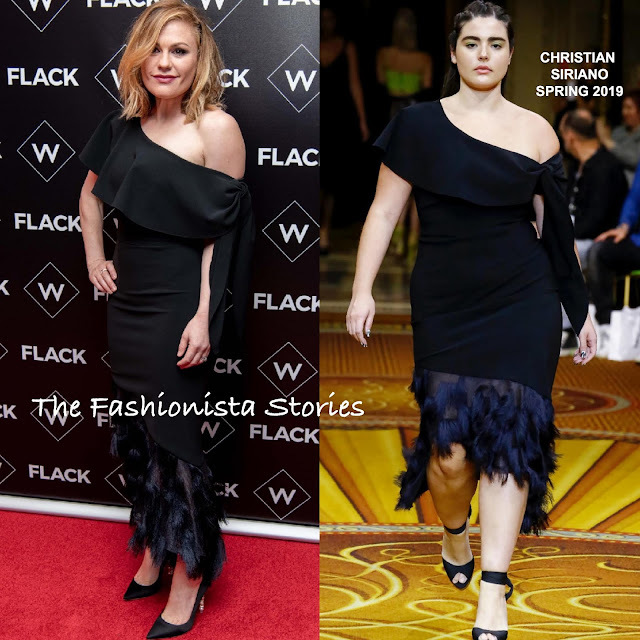 CHRISTIAN SIRIANO seems to be on celebs fashion radar lately as I have seen a lot of the designers pieces on the red carpet lately. Anna joins that group wearing one of the designer's SPRING 2019 dresses. Her black off-the-shoulder, feather hem dress was styled simply with black pumps. Given the length on her, I see why she chose sandals but the dress looks chicer with sandals as presented on the model. However she still looks great. A pink lip and a side parted medium cut finished up her look.